Pakistani TV dramas industry has been going strong for decades and showcasing our culture around the world. All of us remember the classics from the past like Ankahi, Tanhaiyan, Dhoop Kinaray etc. The industry continues to thrive and produce entertaining dramas. Yes, there are disappointments (I’m thinking Mann Mayal), or utter disgusting ones (like Chup Raho) but one thing is for sure, they are all worth an interesting discussion over chai and samosas with your friends. There are many more reasons to watch Pakistani dramas. For some of us these Pakistani dramas are guilty pleasures. Most won’t admit they follow them. Maybe because it’s not always fashionable to own to a Pakistani drama and easier to put them down. But there is something about turning on the TV/Cable/JadooTV/YouTube, curling your feet and losing yourself in the world of Pakistani Dramas. So incase you were looking for justification or motivation here are eight solid reasons to watch Pakistani dramas. 1. Strong story lines: Many dramas are based on novels and because of the limited episode format (13 before and currently around 19-23) the story line is clear and strong. For example, the recent Bushra Ansari starring Jhoot showed the effects of lying on relationships and suggested solutions to the rampant social problem. 2. Just what the doctor ordered whenever you’re missing home: Nothing like watching the typical family politics and dynamics in a drama to get a flavor of the TV lounge discussion in your own home that you’re missing terribly while away. “To kya Saima ne phupo ke baitay kay rishtay se inkaar kar diya, bus Saleha ne tarbeeyat he achi nahi ke bache ke” etc etc. 3. Great looking cast: Maybe just maybe, my opinion is biased. But I think Pakistanis are one of the most good looking people in the world. These fine people together give me just one more reason to enjoy a Pakistani drama. 4. Locations: There was a time in the 90s that the Pakistani dramas were popularly shot in england, dubai, scotland etc (mostly showing mundane malls) but now that I live in Canada I watch the dramas to enjoy the hustle and bustle of streets in Lahore, the dusty lanes of interior Sindh, the mountains of the North and the lakes in Islamabad. 5. The Urdu: Ah the amazing urdu! People like Hina Bayat, Bushra Ansari, Syed Mohammed Ahmed, Samina Perzaada and Talat Hussain make it a joy to listen to their dialogues delivered in crisp fine urdu. 6. Social messages: Dramas like Udaari, Kankar, Dareecha and the upcoming Khuda Mera Bhi Hai raise important social issues and give us all food for thought and hopefully the will for change. 7. Discussion with friends: Nothing like a discussion of Rohina vs Arjumand from Deyar-e-dil to get a room buzzing, or why oh why didn’t Khirad text Ashar in Humsafar and relied on a letter. You might have sworn off gossiping, but you can fill that void in your life by making as many Jeena jokes as you want from Mann Mayal. 8. Family values: All of us want a grandfather like Agha Jaan from Deyar-e-dil, a father like Dureshahwar’s (but definitely not the inlaws) and a Dadi like Saba’s from Bin Roye. The relations and bonds remind us of our own family and give the same warmth to the heart. 9. The soundtracks: Soundtracks like “Yo Humsafar tha” from Humsafar, “Yar-e-mann” from Deyar-e-dil, “Yar ko hum ne Ja Baja” from Shehr-e-zaat, “Asmano se” from Dastaan and so many more are unforgettable and enjoyable over years. Do you watch Pakistani dramas? What do you like the best about them? 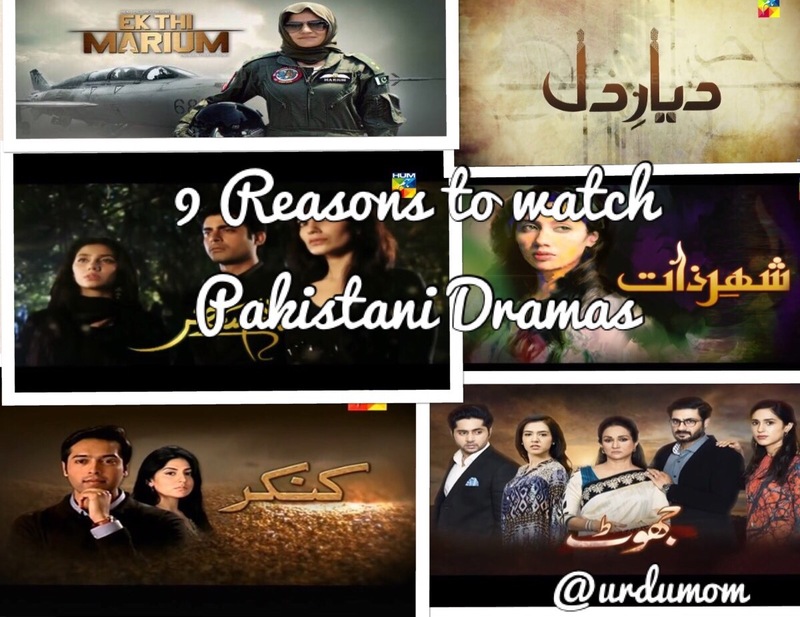 What are your reasons to watch Pakistani Dramas? For a moment I thought u wrote 9 solid dramas instead of 9 solid reasons. Haha. I agree to all reasons tho. I too love the crisp Urdu and the beautiful soundtracks become part of my all-time music playlist. Eye candy like fawad, shehryar and hamza are cure for various illnesses. 🙂 Storylines…hmmm…I suppose har jagah and hamesha se 20 dramas mein 5 achey solid hotay hain. Baki rona dhona typical or perhaps stupider than reality as well like Mann Mayal. But what a hit that drama was!